Some people think camping is “roughing it,” but not if you do it right! 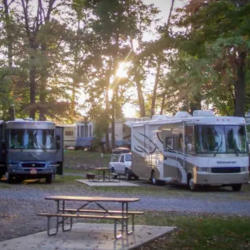 Staying at a campground in PA is what you make it, and our region&apos;s campgrounds have a variety of accommodations and recreational amenities perfect for your level of camping expertise. Keep it simple and rustic with a tent near the tree line or reserve a cozy cabin to snooze under the stars (and a roof). There’s no blueprint, so find an outdoor lodging style that fits your family. RVs/Campers/Trailers: Full and partial hook ups, with a fire ring and picnic table included. Tents: Partial hook ups or primitive (electric only), with a fire ring and picnic table included. Cabins: 1- and 2-bedroom deluxe cabins with indoor plumbing or log cabins that can sleep up to 8. 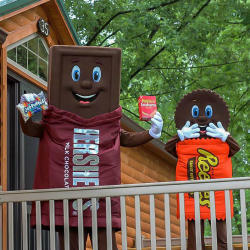 This Hershey campground is like an open-air hotel, with all the accommodations and amenities your family would need. Well, minus a roof and four walls in some areas! Explore the Campground’s multiple playgrounds, swimming pools, indoor game room, courts for basketball, volleyball, and shuffleboard, horseshoe pits, live entertainment, and a Country Store to refill your snack supply. Did you know? You can hop on a free shuttle to Hersheypark from several of our campgrounds! This is a great amenity for those who didn&apos;t even bring a vehicle! Tents: Deluxe sites with water, electric and cable or primitive options, with a fire ring and picnic table provided. Cabins: Studio, large, and loft deluxe cabins with linens, fire ring, picnic table, propane grill, patio, and outdoor chairs, or 1- and 2-bedroom log cabins with fire ring, picnic table, outdoor charcoal grill, and covered patio. This campsite is 30 minutes from the city of Harrisburg and 20 minutes from Hershey & its attractions. Before or after your Pennsylvania day trip adventures, enjoy the fun activities the Elizabethtown/Hershey KOA has to offer. Swim in their pools, compete against the family at mini-golf, horseshoes, volleyball, basketball, and even giant chess, or do a little fishing in their catch and release pond! You can also seek some shade in their rec hall with a big screen TV, movies, puzzles, and a lending library. Did you know? The Pennsylvania Department of Agriculture prohibits the movement of all species of firewood found in neighboring states in an effort to minimize threats posed by wood-feeding insects. But you don&apos;t even need to haul your own logs because these locations have firewood for purchase! Tents: Water and electric or primitive options, with a fire ring and picnic table provided. Cabins: 1- bedroom Kamping Kabins with beds, microwave, small refrigerator, heat and air conditioning, covered front porch, and more. At the Jonestown/Hershey NE KOA, campers can cool off in the Swatara Creek, a pleasant smooth body of water that winds through mountain gaps and scenic farm country. Take a dip, fish for your lunch, or paddle around in a rental canoe or kayak. If relaxation is your style, borrow one of their tubes and float the day away! It’s just a quick ride up the road to the Swatara State Park, which offers 28 miles to mountain bike along and 18 miles of hiking trails including a difficult 2-mile stretch of the famous Appalachian Trail. Around the campground, you’ll find kid’s activities like a playground, a sprayground, and jump pad, and a General Store with live bait, RV supplies, groceries, and a robust food menu! Broaster chicken, jumbo wings, smoked ribs, sandwiches, beer-to-go, and more. Top off your dinner at the ice cream shop featuring 20 flavors of Turkey Hill hand-dipped ice cream and creamy soft-serve selections. 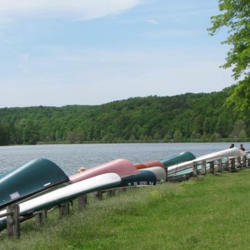 Another adventurous place to camp is Little Buffalo State Park, located north of Harrisburg in Newport. Little Buffalo you can hike, picnic, swim, boat, fish, hunt, spot wildlife, and in the colder months, cross-country ski and ice skate. Their modern campground is open April to October and has 40 sites with and without electric and water hookups. Little Buffalo also has camping cottages that sleep 5, or an ADA accessible Modern Cabin that sleeps up to 12 happy campers! If you&apos;re truly outdoorsy, turn a Susquehanna River kayaking trip into a multi-day paddling adventure when you stay the night on a primitive island campsite. Blue Mountain Outfitters can get you geared up for a 15- to 43-mile ride downstream, stopping to rest at a riverfront commercial campground or site along the Susquehanna River Island Trail. Did you know? 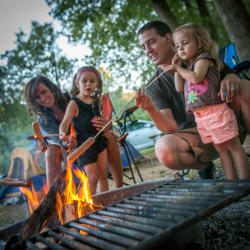 All of the campgrounds mentioned in this blog are pet-friendly! Review each location’s pet policies before packing up your pooch! Harrisburg East Campground has a beautiful canopy of mature evergreen trees that provide a majority of their campsites with much-needed shade. 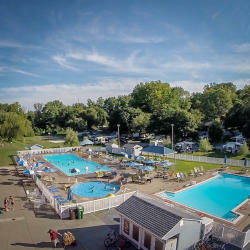 Around the campground, you can take a dip in the swimming pool, let the kids explore the playground, or get a little exercise on the basketball and volleyball courts. Pair free sightseeing with outdoor enjoyment when you visit Wildwood Park and Olewine Nature Center, City Island, Italian Lake Park, and Riverfront Park, all located in Harrisburg! After a day of fun in the sun, it’s time for a night of chasing lightning bugs and gathering around the campfire. We highly recommend indulging in smores made with none other than Hershey’s Chocolate! Hershey&apos;s Largest Candy Store at Hershey’s Chocolate World Attraction for unique s&apos;more mix-ins, like a Reese’s Peanut Butter Cup, York Peppermint Pattie, or a Hershey’s Cookie Layer Crunch, for an extra crispy bite! Keep it simple in a tent or "glamp" it in a cabin with cable - explore the many camping options that the Hershey Harrisburg Region has to offer!